One of the most frequent questions I get regarding office supplies is how do you know what size binder you should buy when doing a large project. Typical questions are, “If the stack of paper I need to put in the binder is 1 inch thick, will a 1″ binder work?” Or, “the binder rings I have measure 2 inches across. Does that mean I have a 2″ binder?” This article takes the confusion out of knowing what binder size you need for that big project. Before delving in to the right binder size for your next big project, let’s talk about binder basics. First, in almost all cases you should purchase view binders if you are doing any kind of presentation. View binders allow you to insert a customized page in the front and back of the binder, and even insert a customized printed spine to give your binder a professional look. A secret most people don’t know – even though view binders cost more for manufacturers to produce, they are typically priced less than standard binders at most office supply stores, because this is where all the volume is. Second, you need to pick the right ring style for your binder. Standard rings are called “round rings”, which are round shaped rings like in the binders most of us used in grade school. “D-rings” are the other common style, and are shaped more like an inverted “D”. They are typically used on higher quality office binders, and preferred for larger projects because they hold about 30% more sheets of paper, and are more durable than round rings. D-Ring Binders have rings shaped like an inverted "D", and are better quality than round ring. For my money, I always go with D ring view binders for my special projects. They are durable, hold more pages, and have the professional look I want to project. However, if budget is crucial for you, and saving money is what’s most important, go with standard round rings in the view binder format. Color choices are typically white, black and light blue. Now to the trickier question. 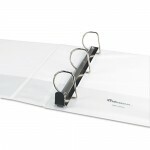 What size ring binder is right for your needs. It’s best to cut through the confusion. You may find fancy sounding terms for ring mechanisms like slant ring, EZD ring and EZ-Turn rings, but they are all basically D-ring binders in designer clothing. So remember this: 1) There are D-ring binders and there are round ring binders, and 2) D-ring binders hold 30% more sheets than round ring. 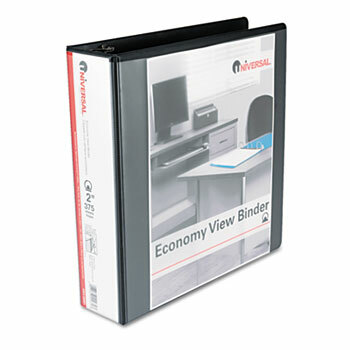 Another question I get is where do I recommend to buy view binders and other office products. I’ll let you decide the best outlet for you, but I buy all my office supplies online from a trusted independent dealer. They have a better selection and lower prices than the Big Box retail stores, and ship free the very next day. I do my best to support companies that practice conscious capitalism, and I’ve found a dealer that does good work by donating half their profits to great charities. Hopefully this takes a little of the confusion out of finding the right binder. Remember, don’t measure the spine, don’t measure the rings, and certainly don’t just guess. The key is determining how many sheets are going in the binder, and selecting the right size for you. This entry was posted in Office Supplies and tagged Copy Paper, d ring binders, Office Binders, office products, Office Supplies Online, view binders, Zuma. Bookmark the permalink. We use a great technology company called Trademark Media based in Austin, TX. We highly recommend them! Thank you for your kind words. We try and make office supplies fun and interesting. Office supplies that Do Good Work is what we’re all about. I actually Believe that article, “What Size Ring Binder Do You Need? I am looking for a 3-ring binder that is wider than the regular binder. My son has to tabs to separate his subjects. On the regular width binders, these tabs stick out about 1 inch and therefore end up falling off from being put in his backpack. We bought one last year (Sasquatch) that was 10 7/8 inches wide and worked great! But I can’t find it in any stores or online to buy anymore. Any tips on adjusting binder size choice when using page protectors? This blog was… how do I sayy it? Relevant!! Finally I’ve found something which helped me. I liked that you mentioned getting a view binder if you are planning on using your binder in a presentation. You also mention that they are typically priced lower than standard binders. I think it’s a good idea to choose a binder that is extremely durable if you plan on using it often since you do not want your project to look bad if your binder is tearing in the corners. Thank you for your comment, Cindy! We’re glad you found the information helpful. Please let us know if you have any questions! Does ANYONE make a 1 3/4″ 3 ring presentation binder? 2″ is too big and sloppy and 1 1/2″ is just a bit too small. I bought sleeves to save space and get rid of the original DVD holders. I’m looking for a 2 ring 6″x9″ vinyl binder. It doesn’t necessarily néed to zip. Any ideas where I can find these? We’re sorry, we do not carry the binder you are looking for. We would suggest shopping on Amazon for this item, as they feature many CD/DVD binders to choose from.